We were fortunate enough to have cruised aboard the Disney Dream this past May and aboard the Disney Fantasy this past September. Previously, we had cruised on Royal Caribbean, Carnival, and Norwegian Cruise Line (NCL). Our favourite experience? Our Disney cruises... By far. Our cruise on the Dream was the first cruise we had been on that actually felt like a family vacation. On our NCL cruise, for example, we felt very much in the minority having a child with us. On Disney Cruise Line (DCL), as like in Walt Disney World, we felt completely comfortable and at ease having a toddler and pre-schooler with us. Everything onboard is constructed and organized for a family with children in mind. We can look at the stateroom itself for our first example. From the larger staterooms, to the bath tub in the stateroom bathroom, to the diaper genie in our room, we knew this was a place our children (and we, their parents) could feel at home. Next, the pool/water areas are amazing. Despite the public health mandate that diapered children cannot be in the pool, Disney thought of everything for their younger guests. Both of my children loved Nemo's Reef (found on both the Dream and the Fantasy). It is a wonderful splash pad area themed after the Pixar favourite, Finding Nemo. For the older children, there is the Mickey pool (shallow), the Donald pool (deeper), Mickey's water slide, the Aqua Lab (on the Fantasy), and who could forget the water coaster, The Aqua Duck. While all cruise lines offer formal nights in their dining rooms to allow guests to dress up and enjoy premium meals including lobster tails, DCL goes one better and also includes a pirate night. While formal nights appeal mainly to the adults, pirate night gives the young and the young at heart a chance to dress up in costume and enjoy pirate-themed menus and entertainment. This brings me to the fact that DCL offers the only fireworks at sea. On pirate night, not only are the guests treated to Mickey's Pirates In The Caribbean show out on the pool deck, but this show is then followed by the Buccaneer Bash and fireworks. It is really a spectacular night. All of the entertainment we saw on the Dream and Fantasy were top-notch. The shows are all directly or loosely based on Disney stories, perfect for Disney fans like us. What was really special, though, was the fact that all of us (parents and children) could enjoy the shows together. They enjoyed seeing some of their favourite stories and characters come to life, and we enjoyed watching the talent and special effects on stage. Although we've enjoyed the food on all of our cruises, we really enjoyed the rotational dining that DCL offers. Switching dining rooms each night while retaining the same servers is a unique experience. The servers were truly the best we've ever encountered. They made the effort to entertain the children at meal times, and tried to diffuse situations (read: tantrums) when they were getting tense. They helped be that extra set of hands that we sometimes needed, like cutting up my son's food for us! The restaurants on the Dream and Fantasy are experiences all on their own! The Enchanted Garden which, during the course of the evening, changes from dusk to moonlight, is a beautiful sight. The Royal Palace (Dream) or The Royal Court (Fantasy) is definitely the most elegant restaurant and certainly makes you feel like royalty. It is themed after the Disney princesses and the chandeliers in each restaurant are not to be missed. Last, but not least, is Animator's Palate. This was our favourite restaurant, although they were different in each ship. On the Dream, the big "show" in Animator's Palate is the Crush show. It is similar to "Turtle Talk" at Epcot. Crush swims through the restaurant stopping to talk to guests along the way. On the Fantasy, guests are asked to draw a person on their placemat prior to dinner. Throughout the evening, different scenes involving food from Disney movies are shown on the screens. Finally, to conclude, our drawings come to life on the big screen. If you're lucky, they may even be shown along some Disney stars in the movies! It is really something to see! Lastly, Castaway Cay was definitely a highlight of both cruises. There is something there for everyone! For those wishing to relax: beautiful turquoise water, soft sand, an abundance of palm trees, but also varied activities for the more active folk. Rent a bike and ride around the island, or take the kids to Pelican Point and enjoy the water slides! Enjoy the sting ray encounter, or Spring A Leak water play area. Don't forget to do the Castaway Cay 5km run before everyone even gets off the ship! We have heard only good things about the Oceaneer's Club and Oceaneer's Lab, however, we did not use these children's areas on our cruises. Our next cruise is scheduled for April 2013 and we intend to take full advantage of these clubs at that time. A report will most likely follow that cruise! While this article was made to be a review of our experience, and not an in depth analysis of any particular area of the cruise, I would be happy to go into more detail of any part of our cruise. Please leave your request in the comments and check back, because it may be featured in an upcoming article about DCL cruises. Contributed by Danielle from Ontario, Canada. She and her husband are Disney Vacation Club Members and visit Walt Disney World several times a year with their two children. 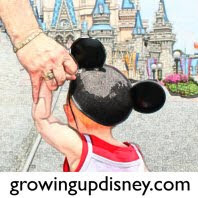 She writes The Fairytale Family and has her own blog, Life As A Disney Mommy. She is a Minnie Mom here at Growing Up Disney.